Alfredo sauce consists primarily of butter, cream and Parmesan cheese. Any further spices are optional. It's served over pasta, classically fettuccine but other noodles such as penne, rigatoni or fusilli work well. Although the dish known as fettucine alfredo originated in Italy, it's not known by that name in that country, nor does their version usually contain so much cream. Brought to the United States by silent film stars Mary Pickford and Douglas Fairbanks, it's essentially an American dish. To make a classic Alfredo in the style of the version found at Olive Garden restaurants, simmer milk and cream together in a saucepan. Add generous amounts of Parmesan and Romano and stir until melted and creamy. The Olive Garden version adds beaten egg yolks to the sauce to thicken it, although other Alfred recipes skip this step. A classic alfredo sauce needs little more than salt and pepper to complete its flavor profile, which is supposed to be rich with the flavors of butter, cream and cheese and otherwise mild. Use white pepper if you want to preserve the color of the sauce. A pinch of nutmeg can be added to add some depth to the sauce. Other recipes brighten the sauce with a touch of lemon zest. Do not use juice as this can cause the sauce to curdle. Parsley garnish can add color to the finished dish; snipped chives can be used similarly. If you add other flavorings to a basic alfredo sauce, keep them subtle. Many recipes call for sliced chicken breast or shrimp for a protein boost, and although you need little more than salt and pepper and perhaps a hint of garlic, this is a good place to experiment with spicing. Cook the shrimp or chicken with spices before adding it to the sauce. Experiment with a Cajun-inspired blend of paprika, cayenne, oregano and onion and garlic powders. Or season the shrimp or chicken with an Italian dried herb blend of basil and oregano plus perhaps some fennel seeds. You can also take your plate of chicken or shrimp alfredo in a different direction by using taco seasoning or a blend of cumin, chili powder and Mexican oregano for a Mexican-inspired variation. The simplest variation on alfredo sauce adds a hit of garlic, in either fresh or powdered form. If using fresh garlic, saute it in the butter before adding the rest of the sauce ingredients. You can also add some heat to the basic dish with a dash of cayenne, chili powder or red pepper flakes. For a similar effect, use a small amount of sriracha, Tabasco or your favorite hot sauce. For a different take, add fresh or dried herbs to the sauce -- rosemary and thyme are particularly suited to the subtle flavors of alfredo, but you can also try the stronger flavors of marjoram and oregano. 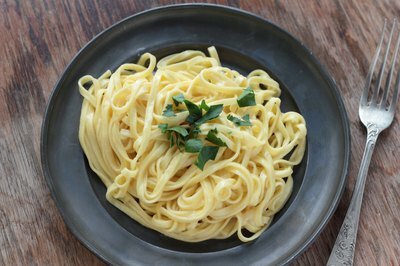 More assertive spicing can move this pasta dish away from a classic plate of alfredo, but the basic sauce is so mild that it welcomes a wide range of variations. Stir in a spoonful or two of basil pesto for a pungent yet creamy main dish. Or, blend in a spoonful of dijon mustard -- a variation that works particularly well with chicken as well as vegetable additions such as cauliflower, broccoli, artichoke hearts or spinach. Add crushed tomatoes for a simple pink or rosa sauce; a splash of vodka or white wine enhances the flavor.